The number of domain names registered under the .ORG extension has increased by 143,512 over the past twelve months, a growth of 1.4 percent, according to the .ORG Domain Registry's semi-annual report. 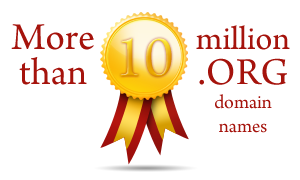 There are more than 10,428 027 domain names registered under the .ORG extension, according to the report. The domain renewal rate of 73,9% combines the first (55,5%), second (72,3%) and third (84.9%) renewal rates. The 55.5% renewal rate is not most impressive but .ORG addresses are not usually used for commercial purposes. Typically, the value of a domain name used for business is higher than that used in the NGO sector, which translates into a higher rate of renewals. For comparison, the average percentage rate of domain name renewals within the predominantly business-oriented .EU domain is 82-83%. The .ORG domain has gained the most popularity in the United States (57.2% of registrations), followed by Germany (4.8%), the United Kingdom (4,2%) and Canada (3,9%). Most .ORG websites are used for informative purposes (20%). Other areas associated with the .ORG domain are as follows: manufacturing (15.1%), services (14.8%), arts, entertainment and recreation (9.6%), public administration (8.4%), healthcare and social assistance (8.3%), retail trade (5.4%. ), education (4.3%), finance and insurance (3.3%), agriculture (2.8%), transport and storage (2.2%), catering and accommodation (1.8%), science and technology (1%). Since May 2014, three new IDN (Internationalised Domain Name) variants of the .ORG extension have been available for registration: in the Russian, Simplified Chinese and Devanagari alphabets. The pool of potential buyers of new .ORG variants is large as the Cyrillic is used as an official country alphabet by 143.5 million people. For 497 million, Hindi is the first language, and for the next 120 million – the second. In the case of Chinese, approximately 1.4 billion people use some dialects of the Chinese language. A significant limitation in the development of the .ORG domain is its non-commercial nature, binding it with projects conducted by non-profit or not-only-for-profit organizations. Creating a commercial brand within this extension appears to have minimal sense. However, the extension provides online opportunities for a great number of associations and organizations. If you are involved in non-profit activities, .ORG domain name may be a great way to mark your unique presence online. Please click on the extension to learn more. If you wish to register a domain name under any other domain, please use the search box to check the name availability. Please do not hesitate to contact us should you have any questions or are in need of assistance. We can be reached at support@web-solutions.eu or via phone on +44 (0) 208 133 3994.